WASHINGTON (AP) — More than half of female Marines in boot camp can't do three pullups, the minimum standard that was supposed to take effect with the new year, prompting the Marine Corps to delay the requirement, part of the process of equalizing physical standards to integrate women into combat jobs. Although no new timetable has been set on the delayed physical requirement, Marine Corps Commandant Gen. James Amos wants training officials to "continue to gather data and ensure that female Marines are provided with the best opportunity to succeed," Capt. Maureen Krebs, a Marine spokeswoman, said Thursday. Officials felt there wasn't a medical risk to putting the new standard into effect as planned across the service, but that the risk of losing recruits and hurting retention of women already in the service was unacceptably high, she said. —Pullups, with three the minimum. Three is also the minimum for male Marines, but they need 20 for a perfect rating. —A flexed-arm hang. The minimum is for 15 seconds; women get a perfect score if they last for 70 seconds. Men don't do the hang in their test. The delay on the standard could be another wrinkle in the plan to begin allowing women to serve in jobs previously closed to them such as infantry, armor and artillery units. The decision to suspend the scheduled pull-up requirement "is a clear indication" that plans to move women into direct ground combat fighting teams will not work, said Elaine Donnelly, president of the conservative Center for Military Readiness and a critic of allowing women into infantry jobs. "When officials claim that men and women are being trained the same, they are referring to bare minimums, not maximum qualifications that most men can meet but women cannot," Donnelly wrote in an email to The Associated Press. "Awarding gender-normed scores so that women can succeed lowers standards for all. Women will suffer more injuries and resentment they do not deserve, and men will be less prepared for the demands of direct ground combat." The military services are working to figure out how to move women into newly opened jobs and have been devising updated physical standards, training, education and other programs for thousands of jobs they must open Jan. 1, 2016, said Navy Lt. Cmdr. Nathan Christensen, a Defense Department spokesman. They must open as many jobs to women as possible; if they decide to keep some closed, they must explain why. Military brass has said repeatedly that physical standards won't be lowered to accommodate female applicants. Success for women in training for the upcoming openings has come in fits and starts. 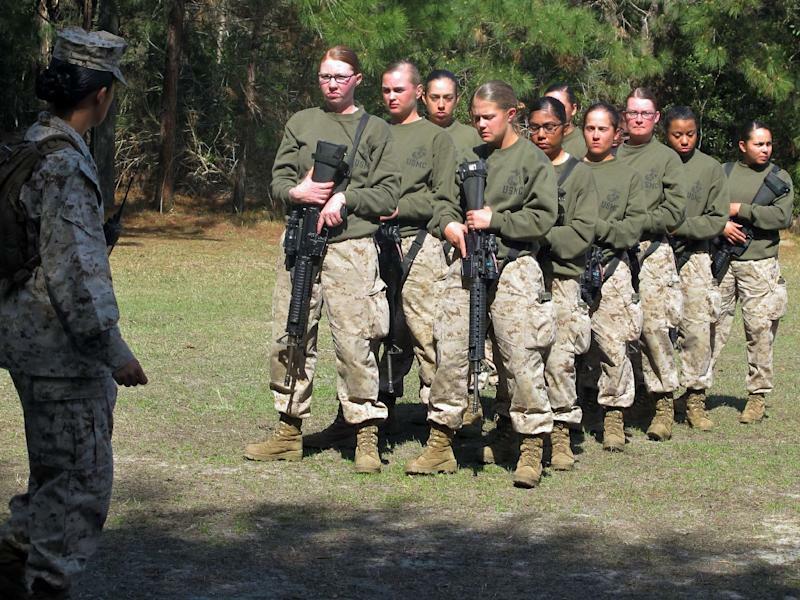 In fall 2012, only two female Marines volunteered for the 13-week infantry officers training course at Quantico, Va., and both failed to complete it. But the following fall, three Marines became the first women to graduate from the Corps' enlisted infantry training school in North Carolina. They completed the same test standards as the men in the course, which included a 12-mile march with an 80-pound pack and various combat fitness trials such as timed ammunition container lifts and tests that simulate running under combat fire. Officials had added specific training for female recruits when the pullup requirement was announced in December 2012, and they came up with a workout program for women already serving. Military testing for physical skill and stamina has changed over the decades with needs of the armed forces. Officials say the first recorded history of Marine Corps physical fitness tests, for example, was 1908 when President Theodore Roosevelt ordered that staff officers must ride horseback 90 miles and line officers walk 50 miles over a three-day period to pass. A test started in 1956 included chinups, pushups, broad jump, 50-yard duck waddle and running. The first test for women was started in 1969: A 120-yard shuttle run, vertical jump, knee pushups, 600-yard run/walk and situps.